Le chapitre 4 de Dark Mirror a été ajouté. Takanuva, Takua, and Turaga Dume walked in single files through the depths of the archives, followed by the silent Toa Tuyet. The ruler of the Toa Empire had not spoken a word since capturing the three of them, simply gestured with her barbed broad sword for them to get moving. They marched for what seemed like hours, through twists and turns past long forgotten exhibits and into regions that probably even the archive caretakers didn't know existed. Takanuva was puzzled. Tuyet could've just brought them back to a cell on the surface, or for that matter, killed them. Why go on a tour of the archives? Things got even more disturbing and bizarre as they rounded a corner and entered a large chamber. In the back were a dozen half badly damaged Rahkshi and an Exo-Toa armor suit missing its right arm. Even more surprising was the sight of two figures clad in black armor who sprang to their feet at the sight of the newcomers, shadow energy crackling in their hands. Takanuva turned around, but Tuyet was no longer there. Standing in her place was another Makuta. This one wearing a scarred and pitted Kanohi Hau. When he spoke, it was in the familiar, grading of the Makuta of Metru Nui. "A simple strategy," he said. "Tuyet has left us with little choice, but to use our shape shifting powers when we venture out, even then we risk capture, just as we have captured you." "I don't understand," said Takanuva. "Why aren't you wearing the Mask of Shadows? I saw it hanging in the archives." Makuta gave Takanuva a look that would have chilled the snow atop of Mount Ihu. "The mask is warded. If it is so much as touched, Tuyet and her minions will know at once. She keeps it there unguarded as a taunt to me. Knowing I long for it and cannot touch it." The two other Makuta and those Rahkshi that could still move closed in. "But you are not so protected Toa. Give me one good reason why we should not kill you now as your kind has killed ours for so many centuries." "I'm not…" Takanuva began and stopped as he debated on how much to tell his captors. These were after all, Makuta. The most evil beings in the universe from which he came. Here though, they were hunted fugitives in a world gone mad. "I'm not one of Tuyet's Toa. My name is Takanuva. I am a Toa of Light." The three Makuta recoiled. Takanuva could understand why, a Toa of Light was the ultimate weapon against beings of shadow. "Listen to me," he continued, "I come from… someplace else where there is no Tuyet. No Toa Empire. I can't claim I understand what happened here, but I do know this: I don't belong here and I need to get back to my own universe." The three Makuta were silent for a moment. Then they began to laugh. A horrible sound that echoed throughout the chamber for long minutes. "And just how," said the Makuta of Metru Nui, "do you propose to get back to this universe of yours my poor, mad Toa?" "By finding the one who sent me on my journey," Takanuva replied. "A being named Brutaka." One of the Makuta nodded. He was tall with armor lined with short, curved, and very sharp blades. "I have heard legends of a Brutaka. It is said he is a great hero who guards a valuable treasure, but in Matoran legend, every pile of rocks is a treasure, every rahi larger than a stone rat is a monster, and anyone who doesn't scream and run when the thunder cracks is a hero of great courage." "Very true Krika. Very true indeed," said the Makuta of Metru Nui. "Very well then. You, Toa, are either a liar, a fool, or a madman. I know not which, but if you need our help, you will have to pay a price." "And what is that price?" asked Takanuva. "A Matoran expeditionist, escorted by a pair of Toa, left Metru Nui weeks ago, bound for the island of Artakha," said Makuta. "They would retrieve an object of power: a Legendary Mask of Time. One of the few weapons that might be affective against Tuyet. By now they have it and are on their way back. I want you to attack their force and steal the mask for us. In return, we will smuggle you out of this city so you can find your Brutaka. But be warned, the Matoran leader is a fanatic who would rather die than surrender his prize. You will have to grant him his wish." "And just who is this leader?" asked Takanuva. "No one you would know," said Makuta Krika. "A Ta-Matoran, someone named Jaller." Takanuva rencontre le Makuta de Metru Nui et Krika dans une cellule, et lui dit qu'il vient d'une autre dimension. 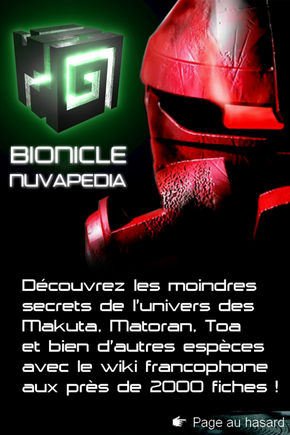 Le Makuta de Metru Nui lui explique qu'il veut bien l'aider à revenir dans sa dimension s'il lui ramène un matoran du nom de... Jaller. Et apparemment,il n'aime pas "Trois Makuta".Je suppose qu'il s'agit de Antroz,Vamprah et Chirox. Pas mal le chapitre. Je me demande si Takua et Jaller sont amis dans cette dimension . . .
Cela m'étonnerait. Ils sont devenus très amis sur Mata Nui, après leur réveil, et surtout après avoir perdu la mémoire. Donc comme l'éxode de Mata Nui n'a pas eut lieu dans cette dimension puisque le Grand Cataclysme non plus, je ne pense pas qu'il soit vraiment aussi complice que de notre côté. D'ailleur, c'est intriguant, mais cela signifit que Jaller n'a jamais eu le Kanohi Hau de Lhikan, non ? Par ailleurs si Makuta posède un Hau, c'est peut-être, justement, celui de ce même mort... Lhikan ? Qui sait, ça reste une hypothèse. De mémoire son Kraahkan est dans la chambre des Trophées des Archives c'est ça ? C'est ce que j'ai compris moi. Ouip, avec quelques trucs comme la lance de Protodermis, la lance de fusion, et tout ce que Tuyet a récolté des Dark Hunters et de la BoM. Tu as posté deux messages à la suite,c'est interdit. Les règles sont dans ce lien. "Article 2 : Les posts successifs abusif sont interdits"
Tu es sur de bien avoir lu? Ouaip.Et pourtant C'EST OBLIGE DE LES LIRE! M'enfin, pas de news sur bioniclestory ? désolé mais je crois que tu a raison sur "le vocabulaire d'aujourd'hui"
La signature c'est le bout qui se trouve sous les message. Tout ce qui se trouve sous les "_________________" fait partie de la signature. Bon, on arrête le Hors-Sujet please. tiens,tu viens d'inventer un smiley: "_________________" c'est bizarre,les yeux,mais bon,comme tu l'as inventé sans faire exprès! Qu'y a-t-il entre les deux ?